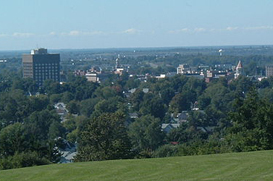 Watertown, the largest city in Jefferson County is located about 20 miles south of the Thousand Islands. In 2010 the population was about 27,000. The 10th Mountain Division of Fort Drum calls Watertown home. The build-up of Watertown is due in great part to having Fort Drum Military Base located in the Watertown area. One of Watertown’s claim to fame is that Watertown is the smallest city to have a park designed by Frederick Law Olmstead, the landscape architect who designed New York City’s Central Park. Watertown is also where the Five and Dime originated, where the safety pin was designed and home to the Car Freshener plant which manufactures the Little Trees car fresheners that you see hanging from car mirrors. The first portable steam engine was also manufactured in Watertown and the Red and Black Football Team, the oldest semi-professional football team in the United States calls Watertown home. If you love county fairs you will be happy to know that Watertown’s County Fair is the oldest continually running fair in the US. Over the past 10 years Watertown has undergone a major expansion with the addition of many stores, restaurants and hotels. To cater to a wide variety of tastes Watertown restaurants include: the Apollo Restaurant for Greek food, Sboro’s Restaurant for Italian and French fare, Cavallario’s Cucina features wonderful Italian dishes, 1025 Ruyi Steakhouse features sushi and amazing Japenese dishes, for Korean food you might want to try Suk Hui Hi. For an old classic restaurant a trip to the Crystal Restaurant is a must. Since the 1930’s this has been a mainstay of downtown Watertown. Around Christmas time make sure to try the Crystal’s famous Tom & Jerry drink a holiday tradition. If you prefer the chain restaurants Watertown has everything from Ruby Tuesdays to T.G.I. Fridays, to Applebees and the Olive Garden. Truly something for everyone. Thompson Park is the perfect place to spend a summer afternoon. You can enjoy the swimming pool, the zoo then have a picnic in the park pavilion. The views from the park are spectacular especially during the July 4 Boston Pops concert and the evening fireworks display. During the fall you might want to visit the Burrville Cider Mill where you can see apple cider made the old fashioned way, pick up a bag of apples and some cider doughnuts while you are there. For those who like to ski and snowboard a trip to Dry Hill Ski area is in order. It is small but a lot of fun! For a change of pace plan a visit to the Jefferson County Historical Society Museum. Here you can spend a peaceful afternoon learning Watertown’s rich history. The Watertown City School District is composed of the following elementary Schools, Starbuck, Sherman, Ohio, North and Knickerbocker Elementary Schools. The other two schools completing the district are H.T. Wiley Intermediate School, Case Middle School and Watertown High School. If you are looking to purchase a home in the Watertown area you will have a wide variety of choices from historic homes built in the 1800’s to brand new developments and everything in between. There are upscale areas and other areas where home prices are very reasonable. If you are searching for a home you can be sure to find something to your liking in Watertown. Click on the local real estate guide to see homes for sale in Watertown or try our power search feature.